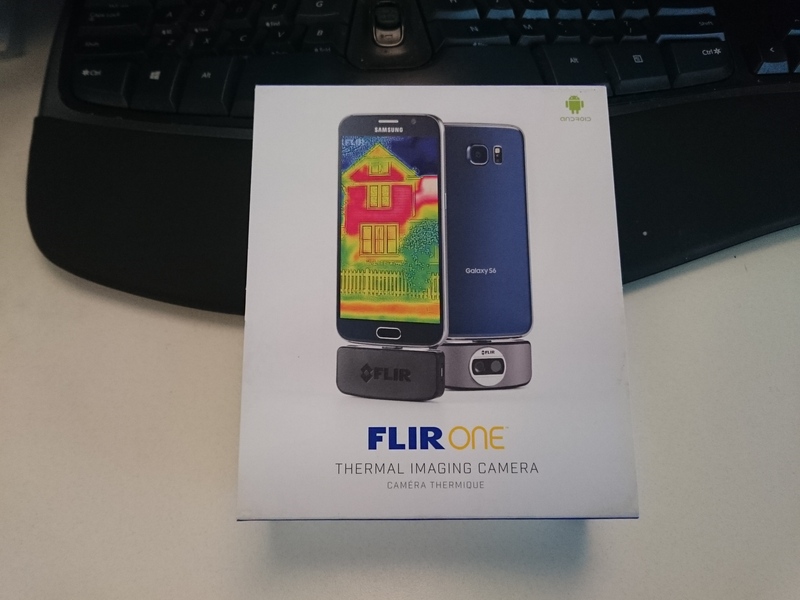 Several months ago I ordered a FLIR One for Android, a small attachment which adds infrared thermal vision capabilities to most Android smartphones and tablets. After the backlog of pre-orders finally cleared out, I got my hands on mine today! 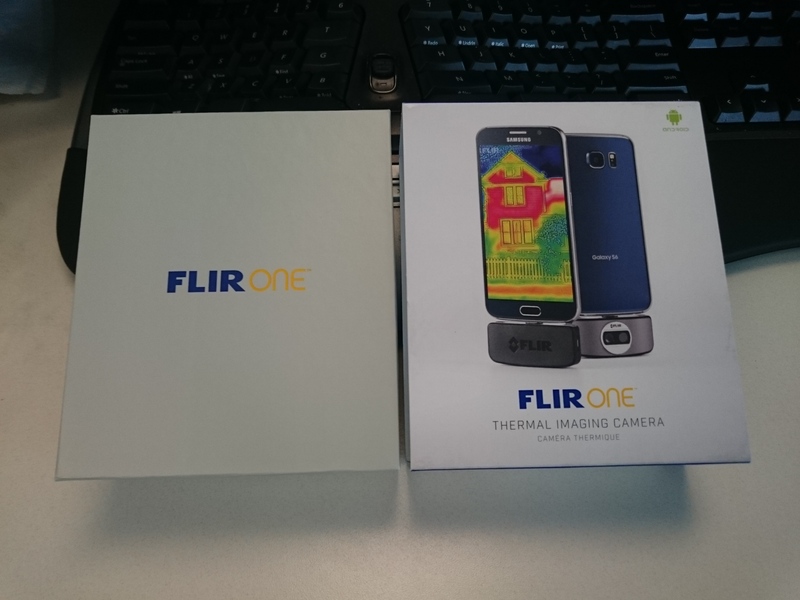 FLIR, of course, has been around in the military and industrial arenas for many years making things like heat sensors used by engineers, thermal rifle scopes, thermal sensors on heat-seeking missles so on. They’ve had a few previous consumer products, including a somewhat less capable version for the iPhone 5S only, but this is an improved and mass-marketed upgrade which looks like a ton of fun. 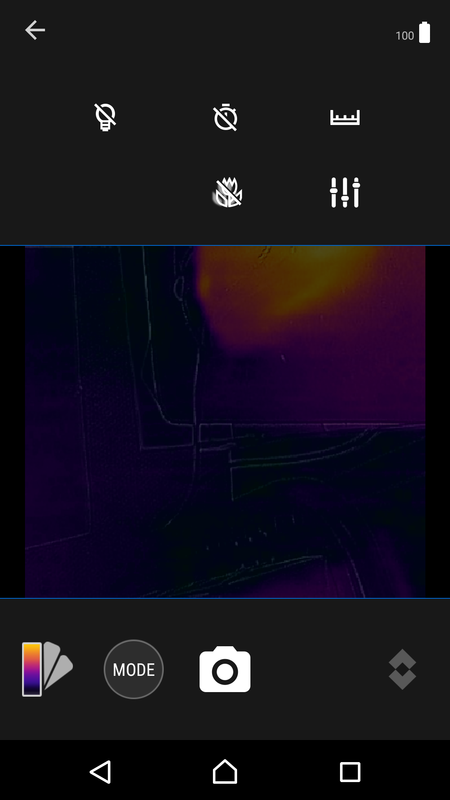 The FLIR isn’t the only game in town even as far as thermal Android smartphone attachments go, but it’s the only one to feature MSX technology which overlays a wireframe of the visible light image on top of the thermal image, giving it more context. 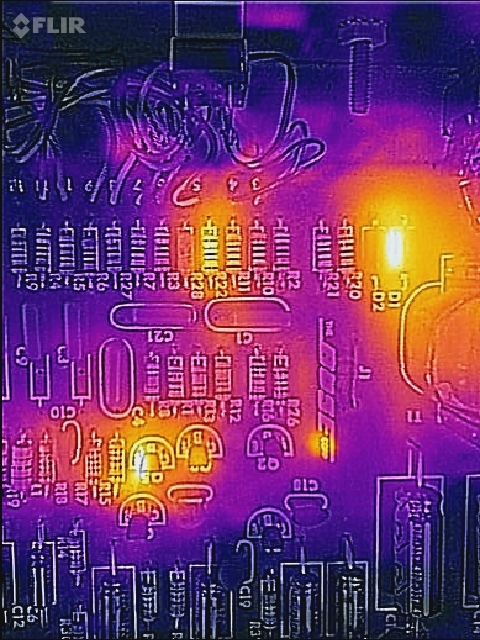 It’s not just blurry heat blobs, which makes it way more useful. I was surprised by the clean and easy to access packaging. That’s it! 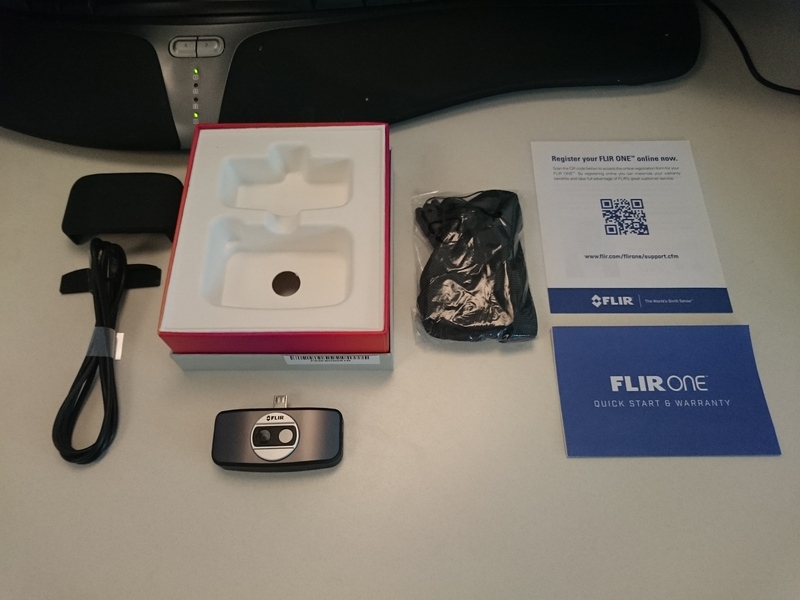 The unit plugs into your phone’s micro-USB port for its data connection, but it’s actually powered exclusively through an internal battery, charged by the FLIR One’s own micro-USB port on the side which has a reported runtime of about 45 minutes. The battery status is available in the companion app, and it can charge from the external charging power while also in use. 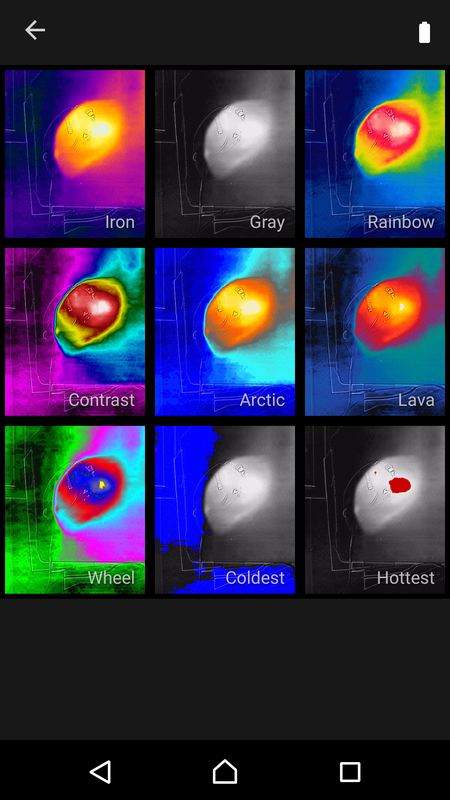 The companion FLIR One app is installed from the Google Play Store. It’s a little quirky on my phone, but nothing too bad. It’s important in my experience to have the sensor plugged in and turned on prior to launching the app, or you need to close and re-launch, even though the app does seem to imply that it can be hot-plugged. Maybe on certain phone models it can, but not my Xperia Z3. This add-on is clearly designed for phones with the USB port on the bottom center as there is no software provision for rotating it’s orientation. On my phone, with the USB port on the side, this is a bit annoying but a short extension cable would fix that. The app is fairly no-frills, and could definitely use some polishing compared with the very sleek physical product that it drives. 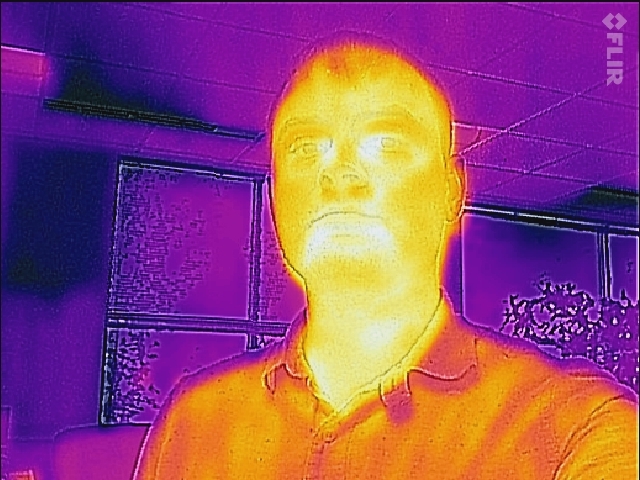 Sadly, the phone’s hard shutter button doesn’t cause the FLIR One app to take a photo, you have to use the on-screen button. In addition, most of the controls are un-labeled – and there’s no “Help” menu, or manual included in the package. 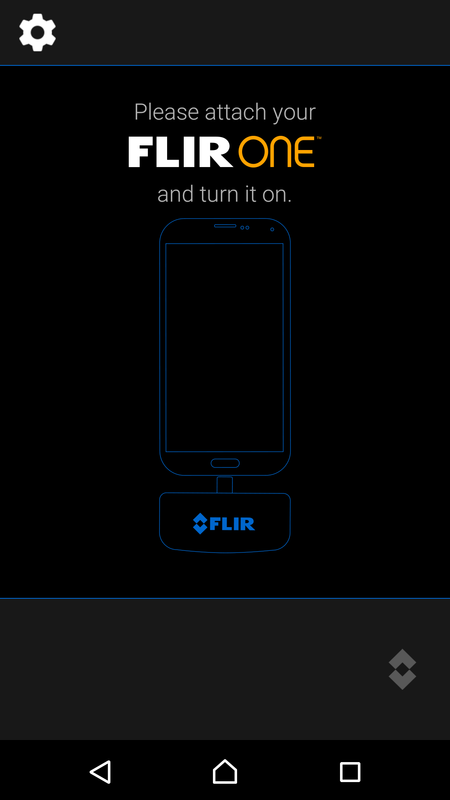 Because the sensor combines a visible-light image with the infrared image, there’s an option to turn the light on (top row left) which crashes the app. There’s also 3 and 10-second self timers, a setting I’m not sure of on the top row far right, a macro setting of some kind on the bottom row, and the settings slider. Selecting the Macro button brings up a slider to adjust the camera parallax, but I don’t see anything actually change while moving it. You can also turn on the temperature display. 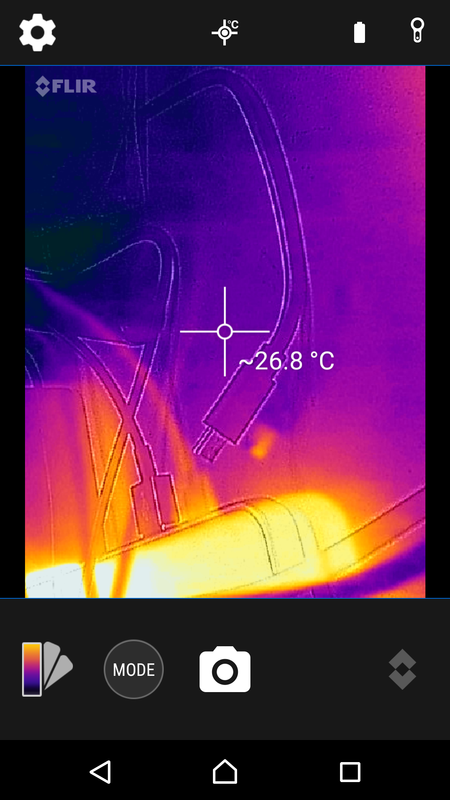 It’s fixed to display the temperature of the center point of the image. 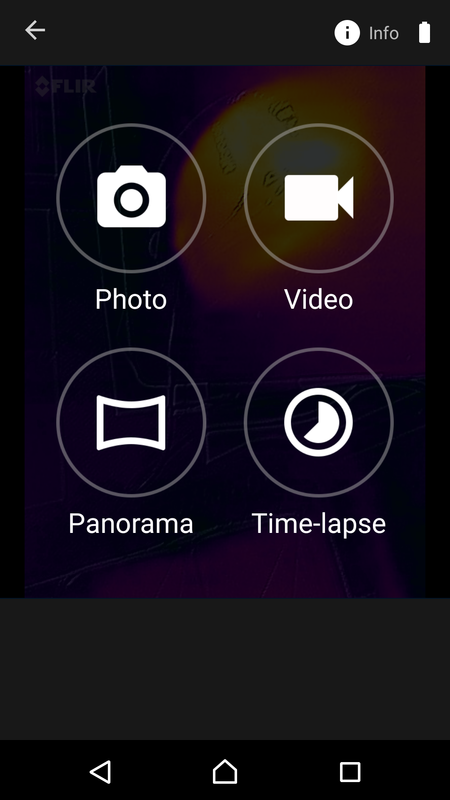 There’s a few other modes, including thermal video, panorama, and time-lapse. And a number of different color pallets and color weights to help visualize what you’re seeing. One complaint from Internet users is that, while you can pick from a number of emissivity pre-sets (Matte, Semi-Matte, Semi-Gloss or Gloss) there’s no option to enter a defined emissivity, if you happen to know it for the material you’re measuring. 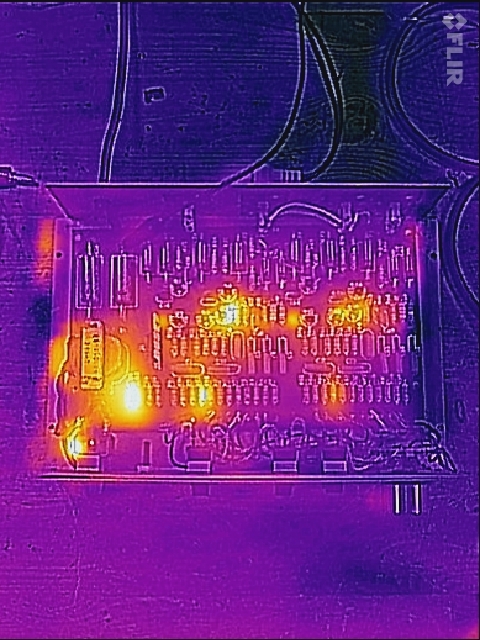 Lack of emissivity settings isn’t a problem for me, though, as I’m primarily going to use this to measure heat dissipation in stereo receivers and radios to ensure correct operation. My impression is that the software feels pretty clunky, which in my experience is common when hardware companies have to write actual software. 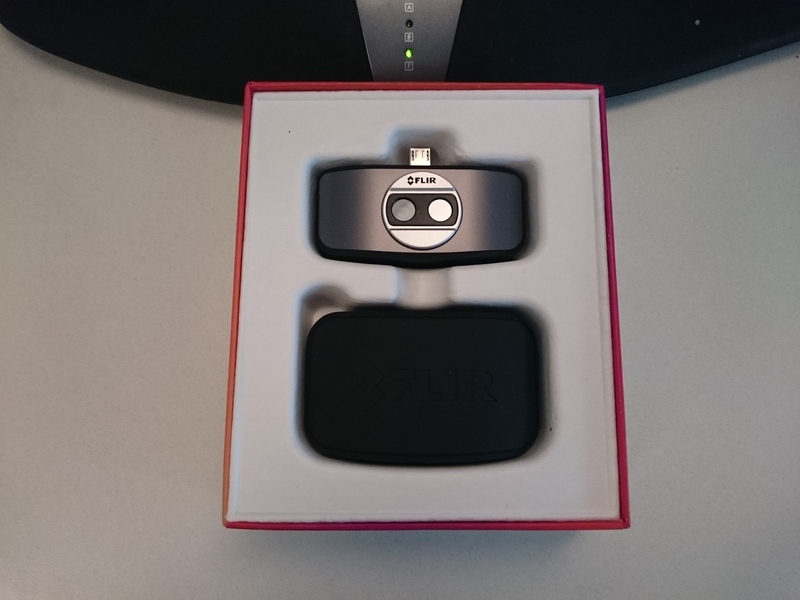 Most of the companion PC apps for lab test equipment that I have are awful to use, too, so I’m going to chalk this up to early-adopter pains, but I expect as more of these get out to consumer’s hands the app will evolve to be more user-friendly. Even with clunky software, though, this is a really fun toy to play with and it’s going to be a very useful tool once I take it up to the shop. 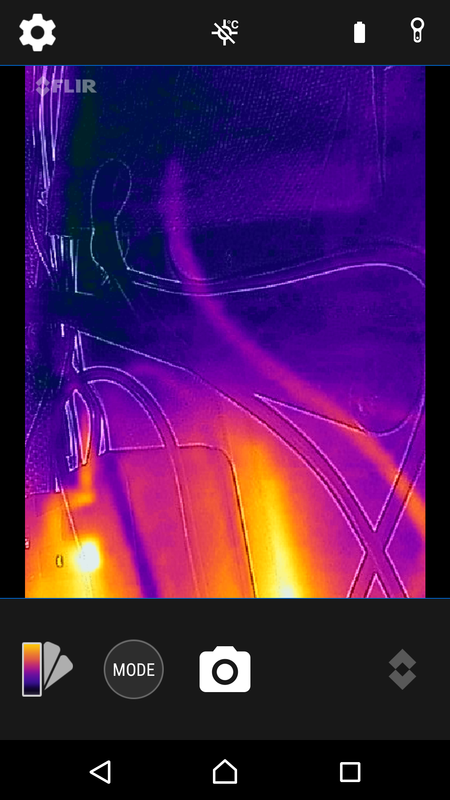 In addition to my use, checking electronics for faults, it would be great for checking for insulation and leaks in your home or car, seeing what that noise was in the backyard, or any number of other things that rely on heat more than light. I also took some photos of my workbench. I need to add my isolation transformer to a switch! 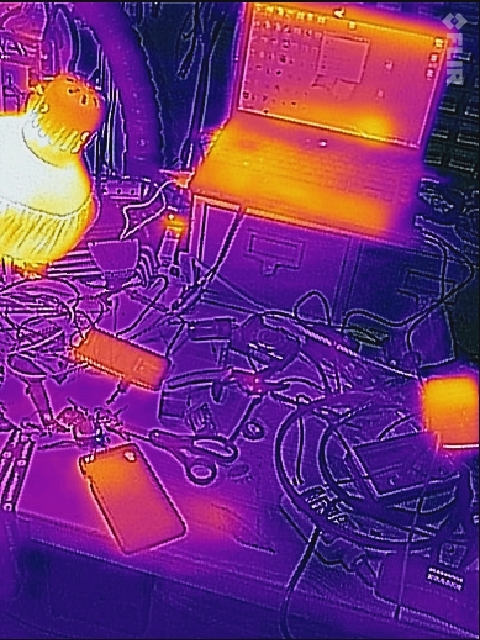 I’ve never noticed that it’s idle current generates some noticeable heat. 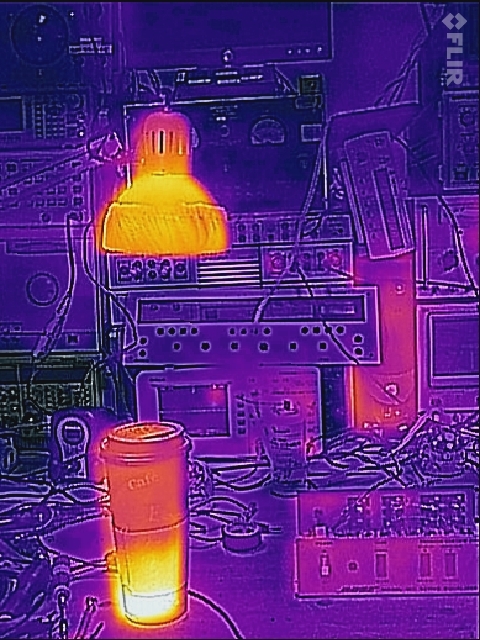 It’s only slightly warm on the touch but it lights up on infrared. What gets hot in a Bose equalizer? 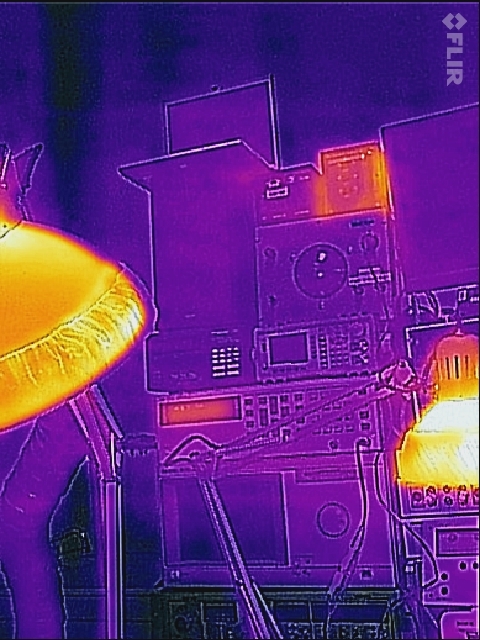 Interestingly, one of the rectifier diodes is dissipating heat but the other is totally cool. All in all, a good buy! Available from Amazon for $249. 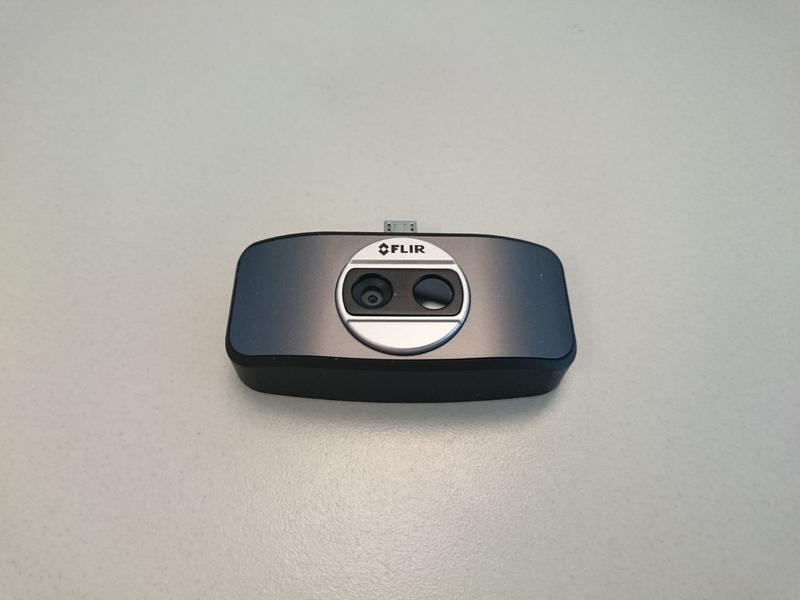 This entry was posted in Electronics, Gadgets, Technology, Test Equipment and tagged android, camera, FLIR, FLIR One, infrared, night vision, Thermal Imaging, thermal sensor. Bookmark the permalink. Nice, J.W., but I like your picture best!!! !